The Marriott Rewards program offers numerous incentives that benefit both business and leisure travelers, with opportunities to earn points at properties that accommodate a wide range of lifestyles and travel budgets. Marriott has properties throughout the U.S. and in 70 other countries. Free Wi-Fi: Business travelers and social media mavens will appreciate free Wi-Fi during each stay. Mobile check-in: Enjoy quick and easy check-in from your smartphone. Simply download the Marriott app for Android or iOS, sign in with your rewards account and select your arrival time. You'll receive an alert when your room is ready and sometimes receive extra points or an opportunity to win prizes. No blackout dates: Unlike some hotel rewards programs, there are no dates that are blocked from points redemption. Travel when and where you want with the points you earn. eFolio: You'll receive an emailed cop of your hotel bill after each stay, so you don't have to keep track of extra paperwork on your return home. Each stay accumulates points that lead to higher, elite status memberships with access to even more perks and rewards. Elite status comes with additional benefits such as weekend discounts, guaranteed lounge access with a complimentary breakfast and complimentary room upgrades. For frequent travelers, elite status bonuses can add up to hundreds and even thousands of dollars in perks and benefits at the higher two levels. There are multiple options for earning points with Marriott Rewards. For the fine print on earning points, refer to the terms and conditions. With over a dozen hotel brands scattered throughout 70 countries, it's not hard to find a Marriott property and start adding your points balance right away. Marriott offers a variety of property types including luxury, moderate, extended stay and boutique hotels. Holding a meeting or event for a large group of people is one of the fastest ways to rack up Marriott Rewards points. Get points for each room night, even if your guests are covering the cost of their own rooms. Earn three 3 points per dollar spent, up to a maximum of 50,000 points. Don't worry if a colleague or business partner helped you put the event together - the reward points can be split in half and shared as long as he or she is a Rewards member too. Each calendar year, you can refer up to five new members. Every time one of your referred members stays at a Marriott property, you'll get 2,000 bonus points, up to five stays per referral. If all five of your referrals each stay up to five times, you can earn up to 50,000 points. Dozens of merchants have teamed up with Marriott Rewards so that you can earn points on every dollar spent on a wide variety of products, from flowers and gifts to computers and apparel. This is done by accessing the Shop My Way mall. Merchant coupons show the number of points you'll earn with each dollar spent. A handful of other businesses can help turn your dollars spent into Marriott points, including Hertz, Cruises Only, NRG Home and Diners Club. Watch for the MegaBonus promotion and register when the dates become available. You can earn a free night after just two stays and find more bonus points offered when signing in to your account. The best part about Marriott points is turning them into rewards. While there are many ways to earn points, there are even more ways to use them. In an effort to entice travelers away from popular hotel alternative services such as Airbnb, Marriott is enhancing its Rewards program to offer increased flexibility for points redemption. Marriott properties are grouped into categories depending on the location of the hotel, the brand and the type. The number of points needed for one night depends on which category the hotel has been assigned to. Each hotel's website has the category number listed on the 'Our Hotel' page, near the amenities and map location information. If you don't have enough points to cover the entire cost of the stay, you can combine cash and points to book your reservation. Check the promotions offered at Marriott Rewards under PointSavers and save 33% on the number of reward points needed to book your stay. Request the use of your reward points anytime between check-in and checkout. Treat yourself to something special by using Marriott Rewards points for a complimentary stay at an upscale Ritz-Carlton property. Ritz-Carlton hotels fall under a tier chart of 1 to 5, depending on the type of property and location. 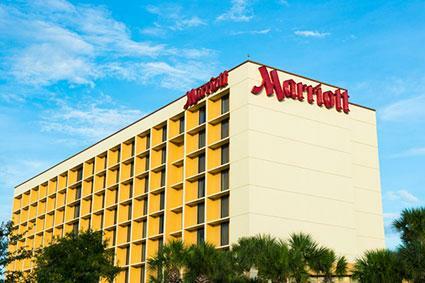 Search for flights or car rentals at Marriott Rewards to use your points to offset the cost of travel expenses. You can also convert your points into miles if you're a member of United's Mileage Plus program. It's important to note that it takes approximately six weeks to add the miles to your frequent flyer account. For faster service, you can contact Marriott Rewards Customer service to ask about express service, which may require a fee. Weeklong vacation packages are available by combining hotel rewards with airline miles or you can use your points for a discount on a cruise. Use points to purchase gift cards from companies like Best Buy, Bath and Body Works, Lowes, Foot Locker and Pier 1 Imports. Points converted into a Marriott gift card can be used for dining, golf or spa experiences. Other organizations naming Marriott as the best hotel rewards program include U.S. News & World Report, Barton Associates and Yahoo Travel. A survey conducted by IdeaWorks Company indicates that Marriott Rewards returns an average of 9.4% of room night spending. This is a 54% higher return than fourth place program, Starwood SPG Awards. Most Marriott brands fall under multiple categories, meaning a Residence Inn in Phoenix may be a category three while a Residence Inn in Birmingham is a category one, making point redemption complicated. Expert travel blogger, Gary Leff of View From the Wing compared several of the top hotel loyalty programs in terms of rewards versus dollar spent at the properties. While he found Marriott to have a good, solid redemption program, Leff indicated the elite membership takes the most nights to earn status but offers some of the least generous benefits. According to US News and World Report, Marriott's top-level platinum elite status is harder to reach than the top levels at Starwood's or Hilton's reward programs. It takes a large number of points to earn just one free night at high category hotels and the Rewards points expire if there is no activity over a two-year period. Travel consultant and avid points collector, Ben Schlappig of Travel Sort reports the 50 nights required to earn mid-level Gold status with Marriott Rewards would put you in the highest levels of other rewards programs. Is Marriott Rewards Right for You? Marriott's flexibility is hard-to-beat with a wide range of property types and solid coverage throughout the United States and in popular destinations throughout the world. However, the high number of nights needed for upper-level memberships combined with less than stellar rewards for elite members may be a deal breaker for some. Before joining any hotel rewards program, be sure it adheres to your traveling lifestyle and offers benefits best suited to your needs.